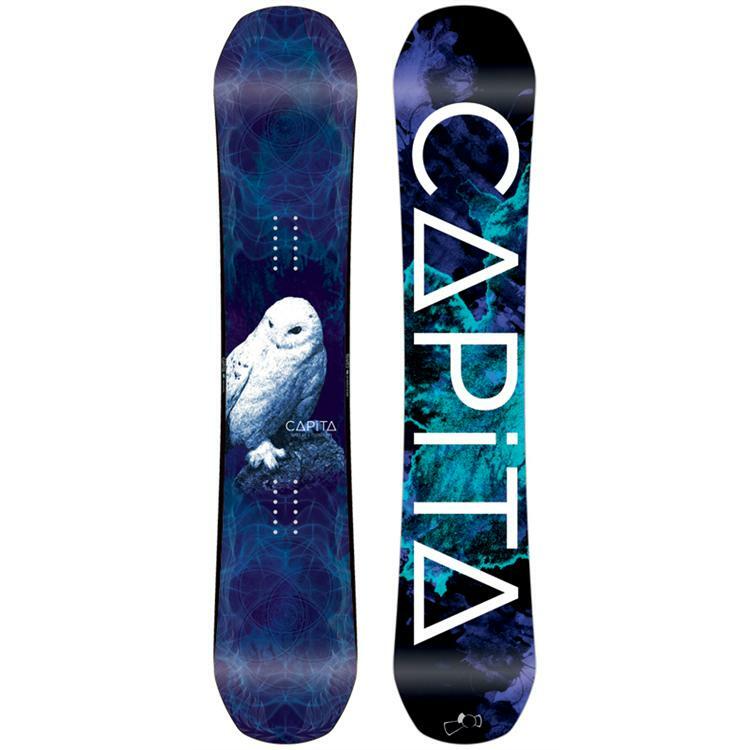 The Capita Birds Of A Feather is a pretty inexpensive but somewhat aggressive hybrid camber twin for those that want to charge regular or switch. It’s got a ton of pop but also some parts that are lacking. 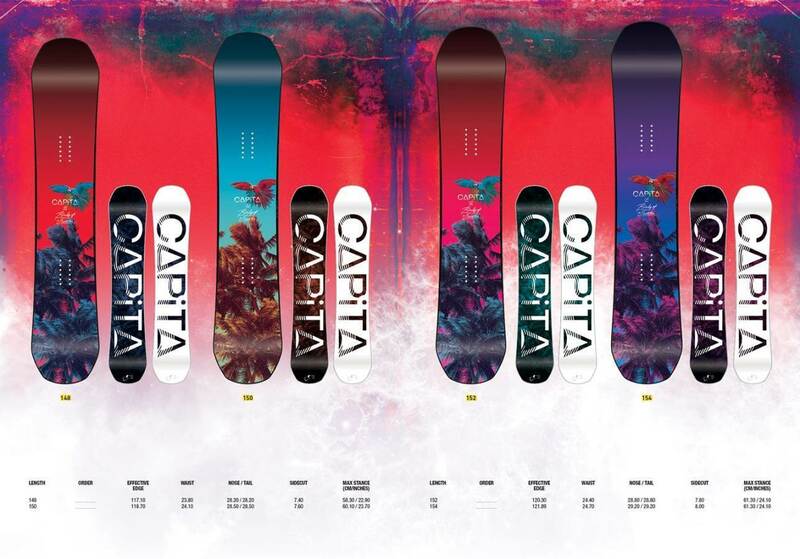 Other than a few minor tweaks the 2017-2019 Capita Birds of a Feather hasn’t changed in terms of specs and design but the flex has softened up a bit over the years without it losing its dampness or pop. Approximate Weight: Feels pretty normal. Nothing heavy or nothing light. 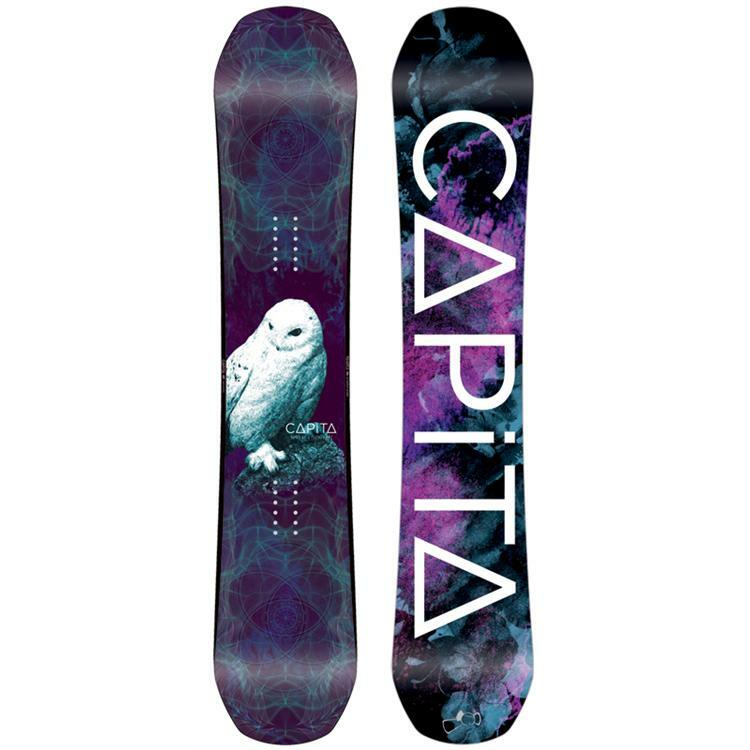 On Snow Feel: The Capita Birds of a Feather is a board for those that must be on their game most or all of the time. It’s more forgiving than a camber board but not by that much. The camber between the feet transitioning to flat with a touch of rocker in the tip/tail makes the board poppy and aggressive but not that forgiving. It’s a fun ride for those who like to ride switch a lot and appreciate a centered stance ride but also want to be a little more aggressive around the mountain and park. Powder: No powder to speak of when this was tested but it’s not really the best thing for that easy float in powder even compared to many other hybrid shaped twins. It’s the kind of board that hangs with many set back all mountain boards on groomers but then struggles to stay afloat when it gets deep. It’s even not as good as many centered stance twins. It’s the kind of board for very experienced riders who learned how to keep a camber twin afloat back in the day. Those kinds of riders will find this easy but compared to most hybrid tech out there these days most will find it a bit behind. Turn Initiation and Carving: Fun if you are past the point of skidding your turns. It’s got a pretty good spring in and out of the turn but it seems that the flat after the inserts in the camber profile seems to interfere with the boards’ ability to spring out of a turn on a harder carve or wider radius turn. It’s much more noticeable on a carve than making short to even moderately wide turns. The flat pops on an ollie well but tries to ruin the radius of the turn. It would be more fun to turn if it was camber between the feet to rocker because the rocker wouldn’t interfere as much. We would all personally like to see less flat and more rocker. Speed: Fast and fun especially for a twin. It’s got the kind of mountain speed that a lot of directional all mountain boards have. I think that’s why many of our all mountain girl riders like this board even though they normally like a directional setback board. Uneven Terrain: It can handle end of the day weekend resort snow but it is not going to be the most forgiving twin when you are out there in the chopped up mess that is a Saturday afternoon. Edge Hold: Not really super solid when the snow gets harder. We’d like to see a little more going on here to help the board hold a little better. Flex: Easier to butter than a camber board but the flex is pretty aggressive. Switch: Very easy regular or switch. The only board easier is an asymmetrical twin. Jibbing: Not really the best jibber in Capita’s line. It’s fine for a mellow box or two but it’s not really a board that wants to lap the jib park all day. Pipe: it’s a decent pipe board but we like boards that can carve more from wall to wall and the flat for us is just a little off. Over time you get used to it but the real issue is the edge hold isn’t there out of the wrapper like many boards to lap the pipe all winter. As it stands it’s more of a softer pipe ride. If you know how to really sharpen up your edges then it might be better. Jumps: That flat camber in the profile kind of screws with the turning radius when carving and turning but it sure helps when it comes to jumps. It’s a nice poppy ride and a good board for those that like air. 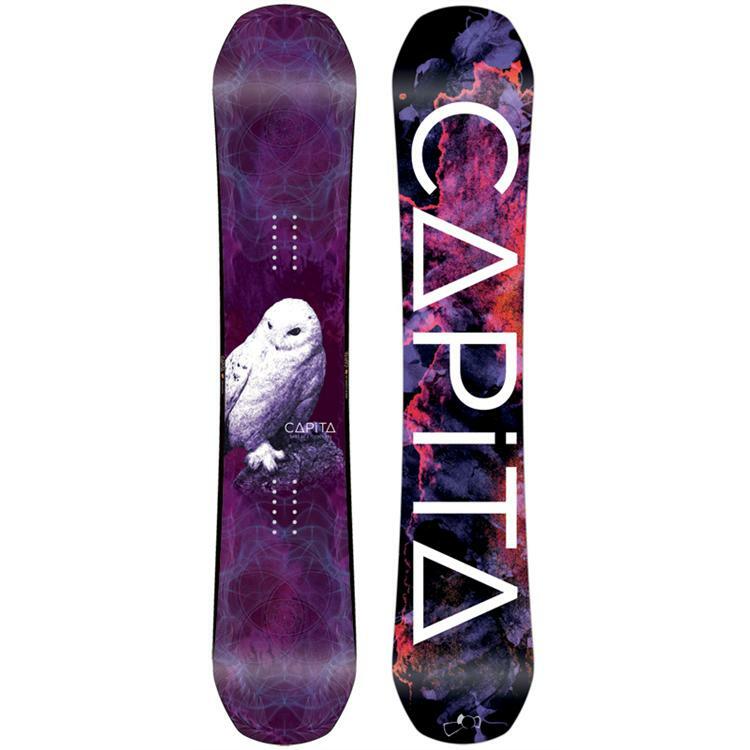 So all in all even though the flat between the camber and rocker deadens the joy of turning a bit and doesn’t float as well in powder as much hybrid camber or Hybrid Rocker boards out there the Capita Birds of a Feather is still a very poppy technical ride that many aggressive all mountain freestyle riders will enjoy. We try to get as many images of the Capita Birds Of A Feather, but forgive us if they're not all there.